Drawing from the two passages above, it is definite and conclusive to say that the world will continue to increasingly grow as a theatre of contrasts between two extreme and opposing ends: a conundrum of change. Perhaps underscoring this view is the position of an Egyptian Political Economist, Professor Samir Amin, who held that, "History is an ideological battle between those who want to change society and those who want the basic status quo to remain." He classed the actors as conservatives and agent provocateurs. The conservatives seek, with decided determination to maintain a given status quos on account of their fear of the unknown and two, fear of being shortchanged from where they butter their breads while in contrast, the agent provocateurs seek to change the basic frays of the society because it does not cater to the greatest of happiness of the greatest number. The greatest happiness of the greatest number is at the core and essence of government at all levels. As we enter a new phase and chapter in our representative democracy, it beggars belief that we are yet to hit our Eldorado. It is not yet Uhuru nor can we shout Eureka. No thanks to the stultifying representation we enjoy today which by and large has dimmed every advance forward. At various forums, what appears to grip discerning politically conscious being and dominates informed public discourse in Igbo-Eze North/Udenu Constituency is the possibility or otherwise of retaining the ill performing member of the House of Representatives or effecting immediate change of guard. In the wards of Dr. Sally Adukwu Bolujoko, a prominent leader who believes change is imperative, "the member of House of Representatives we have is incompetent, snobbish to the extent that he neither takes nor returns the calls by his constituents.” By manner of furthering the conversation, another foremost leader, Ambassador Fidel Ayogu, addressing Udenu party members held that, “there is absolutely no synergistic balance between him, the stakeholders and constituents and as such lacks what it takes to hold such exulted position"
Social media commentators and influencers such as Chidi Eze, Onyeke G Onyeke, Agboja Felix, Chinedu Paul Idoko, Onyema A Attah, Abugu Chiabuotu, John Ojolojo, Ikemefuna Chimex Nelson and very many others have drawn conclusion that he is "aloof and insensitively detached from the constituents to such extent that no meaningful relationship can spring from his quarters.” They are all united in opinion that our Reps member to a relatively high degree has no capacity to provide leadership hence there has been one crisis after another in Igbo-Eze North particularly. He has also been variously accused of being divisive. 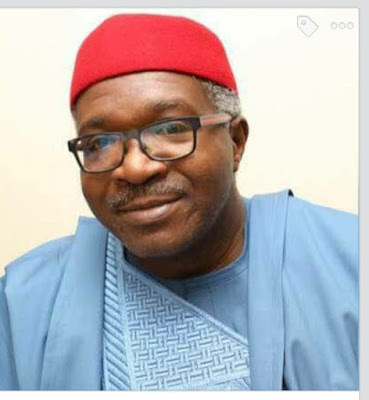 They readily point out a glaring error in nominating and funding only traditional rulers from the Umunano divide for a trip to United States of America to partake in a function by Enugu Ezike people based in USA. Such conduct by a man who by position he occupies should cater to the feelings of all, they argue, is calculated to polarize and divide the traditional Rulers institution. In fairness to him though, he had argued through his media aides that everything that happened in that regards was purely a happenstance as he was invited as an individual. His defence did not sink because either way they didn't trust him or knew better than his defense yielded. The purpose of government is essentially to make light the burden of the people. A good leader leads and addresses the fears of his people. To ignore such expressed fears is an indication of intentional detachment and lack of concern. This is a major and grievous fault. A pebble thrown into a pond causes an impact. The impact upsets the calm of the pond and form wrinkles. If nothing is done, the wrinkles keeps widening and widening causing disequilibrium. That is the pitiable dimension of the leadership we experience today. Leadership that is so detached and disconnected from the people. Agent provocateurs are of singleness of purpose and the purpose is jettisoning a bad leader overboard with a view to enthroning a better one. No wonder the rhyme and rhythm of songs caressing almost all the nooks and crannies of the constituency is about given him a red card and showing him the door to the backroom. Conservatives are no push over. They fight with everything at their disposal because it is their nature never to see the brighter side. They seem to agree with such queer philosophies that teach “a bird at hand is worth more than two in the bush" and "a devil you know is better than an Angel you don't know." These philosophies of suppression decorate their mouths and colour their heads like ribbons. They can only be pitied because it is not their fault. Launching into a fight for their lives, they hardly think about the collective society because it does not matter to them. Every shining stone before them glisters like diamond. Little wonder they failed to see beyond the facades of the widely acclaimed achievements of their principal. They refuse to admit that constituency project is not an achievement because it is a generally distributed project among National Assembly members and does not arise out of the effort of a single member. There is not "MY" achievements in "OUR" achievements. On that level, change agents agree holistically that our MHR has not shown class in any way, nor does he understand the what he was elected to do. Membership of house of representative transcends a secondary issue such as putting up a constituency project here and there. It is not also the onus of MHR to determine what a community needs as priority. The constituents reserve the right to guide their representative as regards their needs and not vice versa. This is why any elected HR member should organize a Town Hall meeting upon election and periodically to interface with his people. Organizing a town hall meeting such as we heard in ones third year is essentially misplaced and out of order. These agents of status quo inundate us with the integrity mantra even at a period when everyone sees through its hollowness. Where is the integrity? Integrity disconnects self-interest and pursues general good. It does not seek to gratify the self. Anything short of this is fraud and a mockery. It therefore mocks sensitivity and tickles the loathing of even dunces to regal us with the integrity mantra, as if we are not witnesses to the murder of same. Where is the integrity in securing the local government secretaryship position and plum jobs for your nephews ahead of all other constituents who slaved for your election while reserving Npower whatever to others? (apologies to my great family allies though). Is it integrity to push for your cousin be the councilor ahead of every other persons even when it was obvious he was not accepted by the ward members? (Well the people had a better idea). If we must be regaled with any mantra to drive a failed experiment (because integrity can't even stand by the time I deal with other fundamentals), the handlers should come up with a typology that strategically fits than lasting around words that is not coterminous with realities. To cut the matter short, what a greater percent of the people hold be true becomes their truth. The truth is that of the failings of our MHR. His few allies are decreasing in number daily. Many of them have become Nichodemus who went to Christ by night. The bolder ones call on phone to pledge their loyalty to the new way. As the day draws nearer to the apocalyptic "oga eme fa n'anya vam" I can only better recoil to my gadfly role of raising critical enquiries. Who shall we send? Who shall we send to efface the darkness and bring on light? Who shall we send to close the chapter of poor leadership and open a new vista of constructive engagement, taking cognizance of the constituents, stakeholders, power players in and out of government, and other critical sectors? Who shall we send to draw out the energy trapped in the youths and unleash same into the development dynamics of our society? Who shall we send to cultivate the ground and sow the seeds of peace and harmony and tap therefrom to ensure the development of our people through synergy? Let us send Prince Dr. Emeka Mama. He combines the zest and zeal of youth, the tasty dynamics of an entrepreneur, a seasoned life hewn out of the trees of royalty but yet at home with all and sundry, a repository of genuine desire to serve our people, a quantum relationship with power players in and outside the constituency and above all, that personal touch which bothers on empathy, compassion and love. Bridging the gap between the old and the young is fundamental to engendering quality leadership where our fathers will feel protected and the youths taste the apples of inclusive governance. And Prince Dr. Emeka Mama has all trapped in him. Little wonder he has become a household name across all strata of the society.